Recent release “Missouri Brew Crew Stories” from Page Publishing author Craig Mengel is both emotional and humorous; this work contains several hilarious one to two page short stories of memories from a group of friends. Craig Mengel, an inventor, entrepreneur, business owner, devoted writer and author, has completed his new book “Missouri Brew Crew Stories”: a hilarious, gripping and potent work about a group of friends called The Original Missouri Brew Crew. Published by New York City-based Page Publishing, Craig Mengel’s entertaining work depicts how friendship is part of the meaning of life. A humorous book of several very short, true stories about a group of characters that live in Southwest Missouri. Everyone has or has had friends over the years that are a part of their life story. Everyone has their own personalities that when combined, create memorable stories that are retold over and over again. 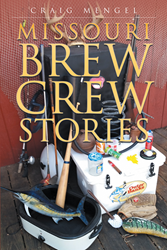 The hilarious Original Missouri Brew Crew’s stories are portrayed in this book. The reader will laugh while triggering memories as they relate their own stories and friends to the group’s characters. Memories can be created anywhere at any time when a person is with friends. Simple events like fishing, golfing, baseball, cooking, or traveling can result in fantastic stories about each other. Yes, a beer or two amongst friends during these events does make things even funnier. Readers will find themselves laughing at their stories and even themselves as they remember some of their own friendship stories. Readers who wish to experience this creative work can purchase “Missouri Brew Crew Stories” at bookstores everywhere, or online at the Apple iTunes store, Amazon, Google Play or Barnes and Noble. Readers can also see one of the books stories at http://www.brewcrewmo.com.